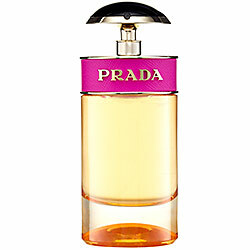 Scent Description and Notes: “Prada CANDY is instantly seductive—pure pleasure wrapped in impulsive charm. In an explosion of shocking pink and gold, Prada CANDY takes us on a walk on the wild side, showing us a new facet of Prada femininity where more is more and excess is everything. Magnified by white musks, noble benzoin comes together with a modern caramel accord to give the fragrance a truly unique signature. Perfume Oil Color: A slightly amber-tinged color. Bottle Design and Artwork: This is a standard 1.5ml sample vial. The vial is a clear glass, a plastic black nozzle, and gold writing (font varies in size) featuring the brand and scent name / company along with the perfume type. ITV: I like it. The vanilla is a soft, Vanilla Fields-esque vanilla with a warm caramel drizzle over a touch of musk and the faintest hint of resinous benzoin to add some complexity. Wet: It’s very similar when sprayed on my skin, although the caramel is a bit warmer and the vanilla is stronger. However, as someone who is not a foody fragrance fanatic, I actually enjoy this one. It’s sweet without being overbearing or cloying, and I think I can attribute that to the musk and the benzoin. Dry: It fades to virtually nothing in a span of only 5 hours. I’m a little disappointed, but I realize that alcohol-based scents don’t have the same staying power as their oil-based counterparts. Upon reapplication, Prada’s Candy is musk, sweet, but less of a chocolate and caramel sweet and more of a cotton candy powder sweet with a hint of vanilla sprinkles. I think I prefer this wet more than dry.